I then asked if anyone thought I looked like a homeless person. Bingo! That was the answer I was looking for. I shared with them that I had once been homeless and stayed temporarily in a transitional housing program where they offered supportive services much like My Sister’s Place Women’s Center. Finding help, and people who care saved my life. The students were all shocked and began to listen very intently to my story. I told them that their answers were accurate in a small number of cases, but many individuals do not fit into the stereotypical image of homelessness. I explained that anyone can experience homelessness; it does not discriminate. A medical emergency, unexpected expense or loss of a job, substance abuse, mental illness, could all leave any of us without a stable home. I was displaced due to fleeing a domestic violence situation. I worked and attended college at that time, and I was determined to get back on my feet and beat the odds that stood before me. Eventually, I was able to move into an apartment and provide for myself and my children. I could not have done this without the support of my family and the supportive services I received while in transitional housing. I needed help, just like the women we have the privilege to serve at My Sister’s Place. With your support, we offer a safe and welcoming environment at My Sister’s Place Women’s Center where women can come to receive services that can be life-changing. 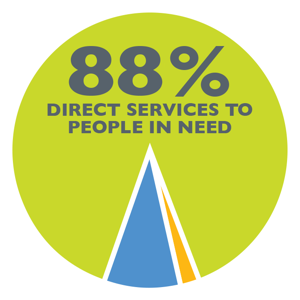 Operating 365 days per year, we are always available to assist those who are experiencing poverty and homelessness. We provide access to daily meals, clothing, case management, life skills workshops, and linkages to housing. These are just a few of the supportive services we offer to address the immediate and long-term needs for homeless women and their children, yet the most important aspect of our work is that we Cherish the Divine Within All who walk through our doors. I invite you to join our commitment to women in need by making a donation in support of My Sister’s Place Women’s Center. Click here to find out how to help. Your generosity helps women and their children endure times of crisis and regain hope and dignity in their lives. Whether someone is in need of a meal, home or job, or facing other challenges, we are here to help with the support we receive from generous donors like you. I know all too well the feeling of hopelessness that comes with homelessness, yet I also know the feeling of relief when help is available to help turn your life around. Help us keep the promise of hope for stability and self-sufficiency for the women we serve at My Sister’s Place.